Kevin Smith’s track record with Batman is a little spotty. In 2009, he began the comic miniseries Batman: The Widening Gyre, which was panned by fans and featured a scene in which the Dark Knight pissed himself. However, he’s redeemed himself a little today with his spot-on comments that there really should be a Batman movie that does Mr. Freeze justice. Of course, Mr. 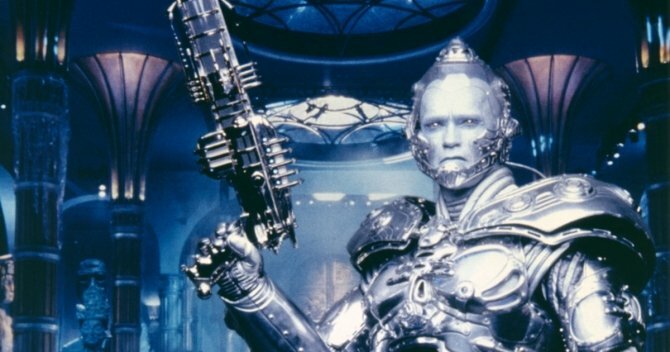 Freeze has already made it to celluloid in the notoriously terrible 1997 film Batman and Robin, which managed to kill the franchise for eight years until Christopher Nolan took the hero back to basics with Batman Begins. Played by Arnie, they made a character famous for his tragic obsession and background little more than a dispenser of excruciating puns: “They’re not going to send me to the cooler” and “The iceman cometh!” are two highlights. But let’s do our best to forget that and, as Smith recommends, hope that they take inspiration from his fascinating portrayal in Batman: The Animated Series. If Warner Bros. were looking to bring Mr. Freeze back, they should also dig into the video game Arkham City, which realized his look, demeanour and obsessions perfectly (as well as having one of the best boss battles in gaming history). Plus, as Smith perceptively points out, this particular Batman villain being given a serious treatment would be a nice change from seeing the Joker show up yet again, don’t you think?